Ticket Alert: There are less than 50 tickets left, Gate Tickets $80 if available, so don’t wait for the gate! 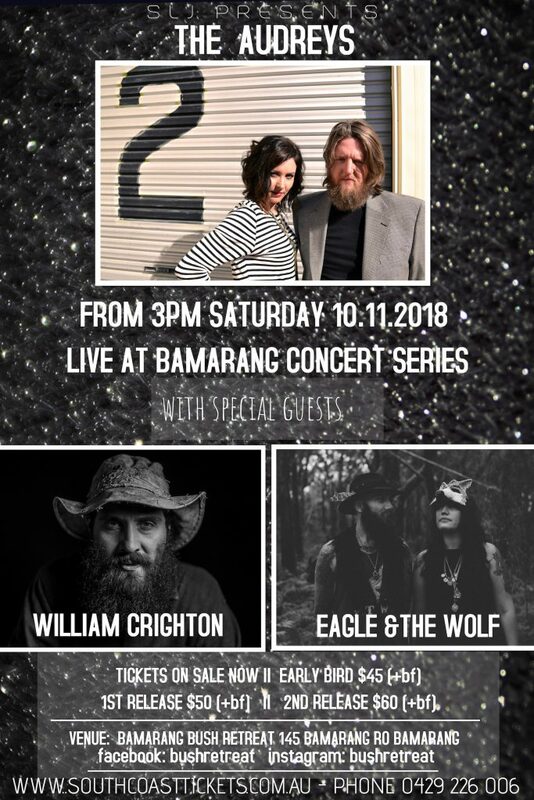 The Audreys, William Crightonand Eagle & The Wolf will take the stage on November 10th for the second instalment on the series. Held on the grounds of Bamarang Bush Retreat, a venue set in a hidden valley amongst ancient bushland, just ten mins from Nowra. BYO drinks and there will be food available for purchase. Children under 12 are free, with a $5 donation on site requested for child minding and entertainment provided. Live favourites and multiple ARIA award winners The Audreys have graced almost every major festival in Australia and played more gigs than they can count. They’ve rocked festivals and clubs in Europe and North America, sold songs to films and tv shows far and wide, written music for theatre, won awards, hit the charts, gone gold and pawned their very hearts for rock and roll. William Crighton announces his landmark second album, EMPIRE. With Empire, Crighton delivers both ageless and untempered fire and inexhaustible forward momentum. If you have not seen William Crighton, this is the perfect setting to do so. He is quite possibly the most fearless and powerful songwriter to emerge in Australia in the last 10 years! Produced by established producer and collaborator Matt Sherrod and recorded in a series of evocative settings, “Empire” expands Crighton’s powerful sound into sprawling new planes and finds the singer-songwriter bringing a cinematographer’s eye for detail to bear on his unique and immersive lyrical style. Having been described as a visionary and a penetrative lyricist, Crighton doesn’t buy into that, humbly and sincerely laughing it off. In 2017, Crighton released 7-inch vinyl ‘Hope Recovery’, accompanied Dan Sultan and CW Stoneking on their respective national tours, and performed to thronging crowds at WOMADelaide and Woodford Folk Festival. He showcased at Canadian Music Week, New York City’s Mondo Music Conference and the Folk Alliance International in Kansas City. Built from heartbreak, forged on love. Sarah Humphreys and Kris Morris met and decided to make a life and music together as Eagle & The Wolf. There’s nothing fancy or fake here, just open hearts, great songs and the truth. Together they are truly magical. Their self-titled album, co-produced by the duo alongside Syd Green (Matt Tonks, Dirty Lucy, Iota), was recorded in an old farmhouse in the Southern Highlands of NSW, Australia. You can hear every breath, the crackle of the fire, and birds calling in the distance. It’s as raw and heartfelt as it gets. Come join us for this powerful, eclectic musical feast in this fabulous bush retreat!